20th November 2018 is the due date to file GSTR 5 for the month of October 2018. In our previous articles, we have discussed the basic GST Returns GSTR-1, GSTR-2 & GSTR-3. Now we move on to discuss special returns such as returns to be filed by non-residents. Who is a Non-Resident Foreign Taxpayer? What happens if GSTR-5 is not filed? What happens if GSTR-5 is filed late? Every registered non-resident taxable person is required to furnish a return in GSTR-5 in GST Portal. 2. Who is a Non-Resident Foreign Taxpayer? 3. Why is GSTR-5 important? It will contain all business details for non-resident (NR) including the details of sales & purchases. Information from GSTR-5 will flow into GSTR-2 of buyers. 4. When is GSTR-5 due? As per the GST Act, due date to file GSTR-5 is every 20th of next month. For instance, the return of September 2018 will be due on 20th October 2018. Due date of GSTR-5 for the months of July to December 2017 has been extended to 31st January 2018. Due date of GSTR-5A (OIDAR) for the months of July to December 2017 is also extended to 31st January 2018. This is a special certificate of registration issued to a casual taxable person or a non-resident taxable person. The registration is of a temporary nature and is valid for the period specified in the application or 90 days from the effective date of registration, whichever is earlier. In such a case, the NR must file GSTR-5 within 7 days after the last day of the period of registration. 6. What happens if GSTR-5 is not filed? 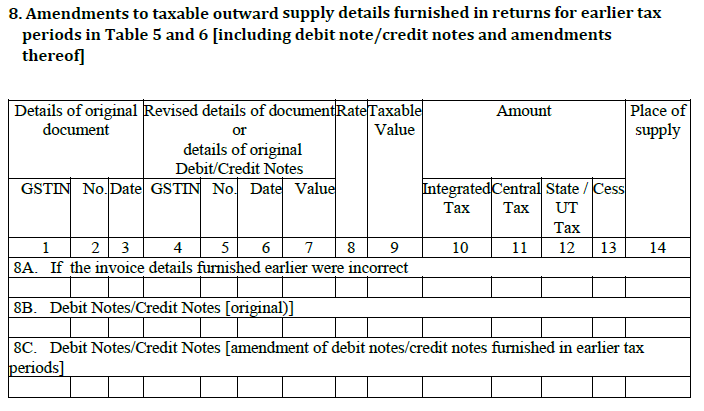 If GSTR-5 return is not filed then the next month’s return cannot be filed. Hence, late filing of GST return will have a cascading effect leading to heavy fines and penalty. 7. What happens if GSTR-5 is filed late? Interest is 18% per annum. It has to be calculated by the taxpayer on the amount of outstanding tax to be paid. The time period will be from the next day of filing (21st of the month) to the date of payment. A late fee is Rs. 50 per day and Rs. 20 per day if a nil return. The maximum late fees is Rs. 5,000. Update on 7th March 2018! There are 14 headings in GSTR-5 format prescribed by the government. We have explained each heading along with the details required to be reported under GSTR-5. Validity period of registration– The validity period will also be auto-populated. Month, Year – Mention the relevant month and year for which GSTR-5 is being filed. The NR must report inputs and capital goods imported into India. 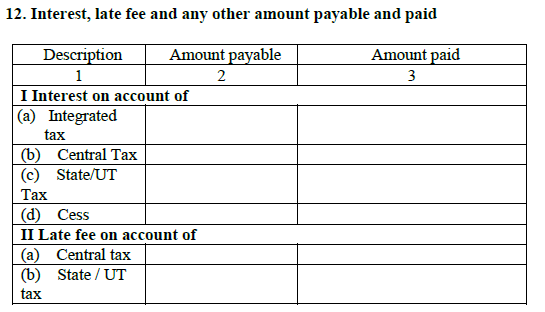 Details of Bill of entry along with rate of tax, IGST, cess paid and amount of ITC available. Note: A NR will only have import inward supplies (purchases). In this section, the NR can change any details in imports furnished in earlier returns. This heading will contain invoice wise details of B2B sales in India including sales to UIN holders. Details of IGST/CGST & SGST & Cess along with State must be given. This heading will contain all details of B2C Large sales, i.e., inter-state sales (where invoice value is greater than Rs.2.5 lakhs) to unregistered persons. This will contain details of sales to unregistered dealers (B2C Others). Both intra-state and inter-State sales less than 2.5 lakhs must be mentioned. Intra-state sales can be mentioned in a consolidated summary. Inter-state sales must be mentioned state-wise. This heading will contain any changes in details of B2B and B2C Large of previous months. Original debit notes and credit notes issued during the month will be furnished here. Amendments to invoices and debit & credit notes issued will also appear here. In case of revisions, original details have to mentioned. This heading will contain changes in details of B2C sales of previous months (originally disclosed in Table 7). This heading will show the total tax liability. A. On account of outward supply: This subheading will show details of tax liability for outward supplies for the current month. B. On account of differential ITC being negative in Table 4: This will contain the additional tax to be paid due to the reversal of ITC (i.e., differential ITC being negative) on making changes in any imports of earlier months (Table 4). This heading will have the details of tax you are actually paying during the month. Breakup of IGST, CGST, SGST & Cess will be shown. The taxpayer can opt to pay through cash or use ITC. This heading will contain details of interest and late fee due and actually paid on account of late filing of the return. This heading will contain the details of all refunds received into electronic cash ledger. There is a dropdown to select in which bank account the NR wants to receive the refund. This will show the debit entries in electronic cash ledger, i.e., cash outflow for payment of tax/interest/late fee. It is populated after payment of tax and submissions of return. Finally, the return is verified by the authorized signatory. Authorized signatory is a representative of the NR and must be a person resident in India with a valid PAN. File your GST Returns using the ClearTax GST Software.